I picked up these new Ghostbuster Edition Twinkies at a very modest price. I can’t help thinking if I had purchased these from an import store the box would have been around £10, so I’m pleased to say these were an absolute bargain in a discount store. 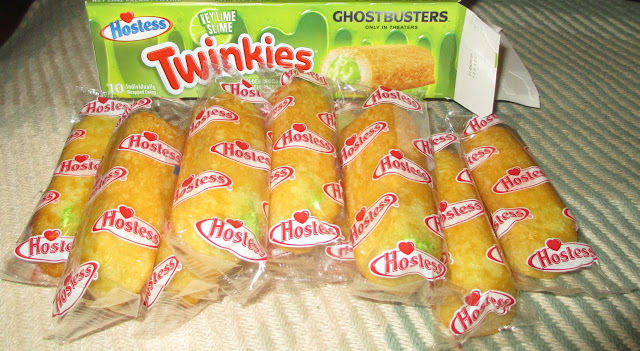 Twinkies are a cult sponge cake in the States and aren’t easy to find in the UK, so finding the Limited Edition Ghostbusters version was rather exciting. 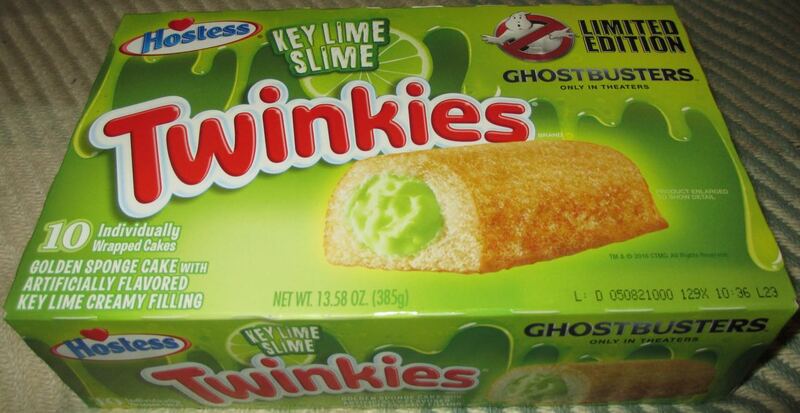 The flavour is Key Lime Slime in honour of Slimer from the film franchise. Now I know there were some clues on the front of the box, but the greenness of the filling still took me a few seconds to become accustomed to. As I get older I haven’t lost my love of sweet tastes, but I am developing a slight aversion to food colourings that are garish. I know green is the colour of movie slime, and I tried to let it go. The cakes themselves are lovely, they are soft spongey and slightly moist and sticky. 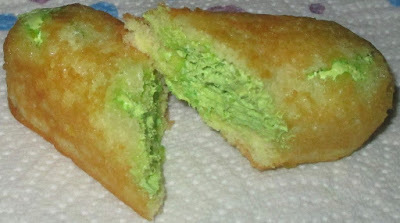 The filling is thick, creamy and well shipped. Although there is still plenty of vanilla, the Key Lime Slime element adds a nice citrus twist. The added flavour isn’t very strong, it is just enough to give them a fruity taste, which is acidic and has a nice hint of lime. I liked the taste far more than the colour! Really looking forward to see the movie though, hope its as good the original.